My name is Chuck but my friends call me… just about anything you can think of. I have yet to grow up, but when I was little I lived right outside of Boston (the BEST sports town anywhere). It’s been 25 years since I first came to Hilton Head Island, and to me, the biggest* change has been the number of parks! If someone were to ask me for advice about marriage, I would make sure they had 4 years to hear my answer. My line of work is totally unrewarding and I chose this profession because I’m not to smart (just like most of my customers). If I were major of HHI, my first order of business would be to build ANOTHER park? Or maybe come up with a plan for the area once known as The Mall at Shelter Cove. My favorite time of the year on HHI is anytime there are more locals here than people from Ohio. 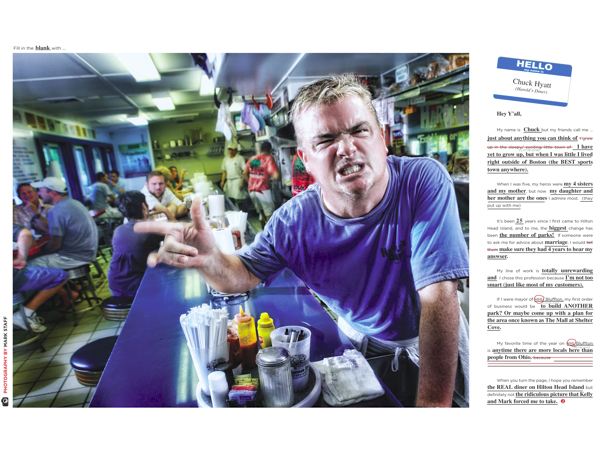 When you turn the page, I hope you remember the REAL diner on Hilton Head Island but definitely not the ridiculous picture that Kelly and Mark forced me to take.